The major Lucio Fontana retrospective, now presented at Paris Museum of Modern Art, is the first one in France since 1987. Following a quite classic chronological path, it nevertheless offers an original approach to the Italian artist’s career, and presents a large selection of rarely seen works. Lucio Fontana et ses « lunettes spatiales », 1965. 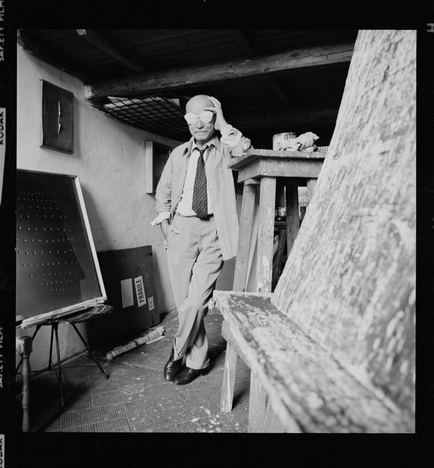 Photographie Lothar Wolleh © Dr. Oliver Wolleh © Fondazione Lucio Fontana, Milano / by SIAE / Adagp, Paris 2014. Born in 1899 in Argentina, Lucio Fontana (1899-1968) was the son of an Italian-born trained sculptor. Spending most of his life in Milan, Fontana explored all the possibilities offered by sculpture (terracotta, ceramic, mosaic) and extensively collaborated with architects. 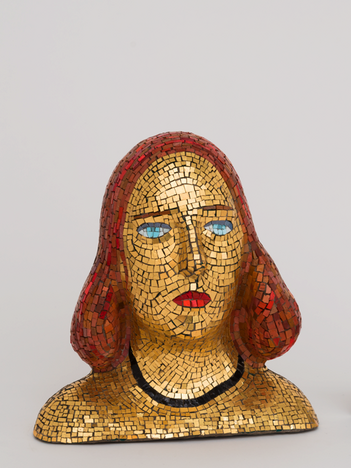 Retrato di Teresita (Portrait de Teresita), 1940, collection Fondazione Lucio Fontana, Milan © Fondazione Lucio Fontana, Milano / by SIAE / Adagp, Paris 2014. 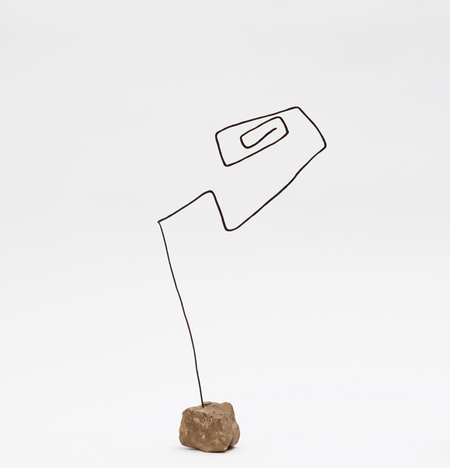 Scultura astratt (Sculpture abstraite), 1934, collection Fondazione Lucio Fontana, Milan © Fondazione Lucio Fontana, Milano / by SIAE / Adagp, Paris 2014. Becoming of one the first Italian abstract artists in the 1930’s, he sought refuge in Argentina during World War II. 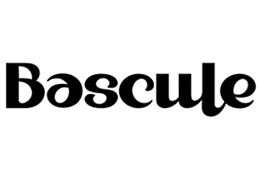 Back in Milan after the conflict, he became the main figure of the Spatialist Movement, which he extensively defined in his Manifestos. Spatialism used light and “real” space (in opposition to virtual space) as basic elements, in order to create a new kind of art, an art that would allude to the space age (which fascinated Fontana) but which would also actively connect to the surrounding world. Scultura spaziale (Sculpture spatiale), 1947, Musée national d’art moderne, Centre Pompidou © Centre Pompidou, MNAM-CCI, Dist. RMN-Grand Palais / Christian Bahier / Philippe Migeat © Fondazione Lucio Fontana, Milano / by SIAE / Adagp, Paris 2014. 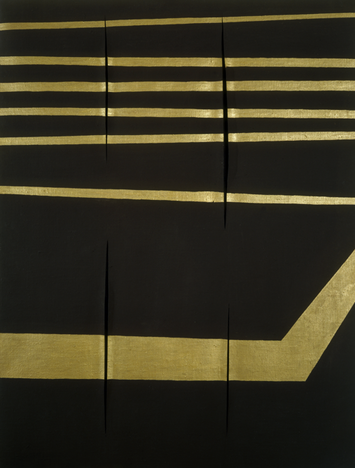 In 1949, Fontana thus created his first Concetti spaziali (Spatial Concepts), a series of punctured canvases and, about ten years later, he would produce the Tagli series, the famous incisions on canvas that gained him a worldwide reputation. 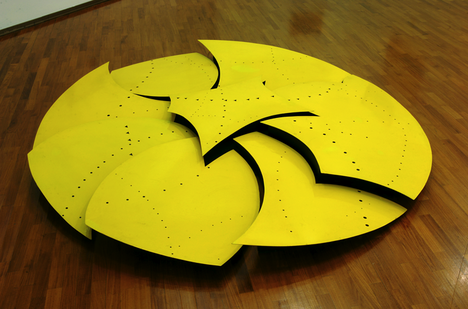 Concetto spaziale (Concept spatial), 1952 GAM- Galleria Civica d’arte moderna e contemporanea di Torino © Fondazione Lucio Fontana, Milano / by SIAE / Adagp, Paris 2014. 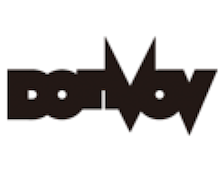 Even if this part of Fontana’s career is undeniably the most famous one, and the one that imprinted the biggest mark on other artists, it is not the most widely represented in the retrospective. 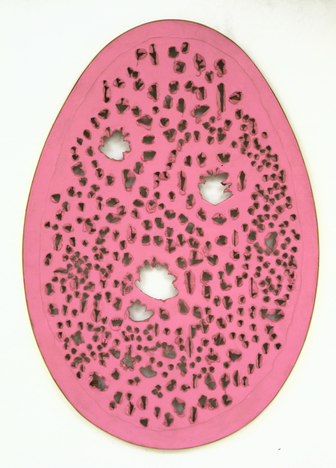 Concetto spaziale, Attese (Concept spatial, Attentes), 1959, © Musée d’Art Moderne / Roger-Viollet © Fondazione Lucio Fontana, Milano / by SIAE / Adagp, Paris 2014. These splendid works, peaceful in spite of the seemingly violent gesture that gave birth to them, only appear, according to chronology, in the latter part of the exhibition, when the eye and mind of the visitors are already full of emotions and incredible discoveries. 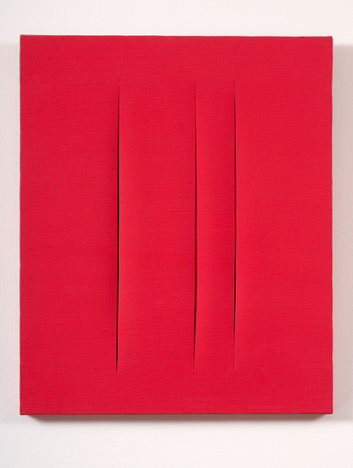 This slightly lowers the effect of the lacerations, even if they remain powerful and fascinating after all these years, making Fontana really stand out as one of the major artists of the twentieth century. 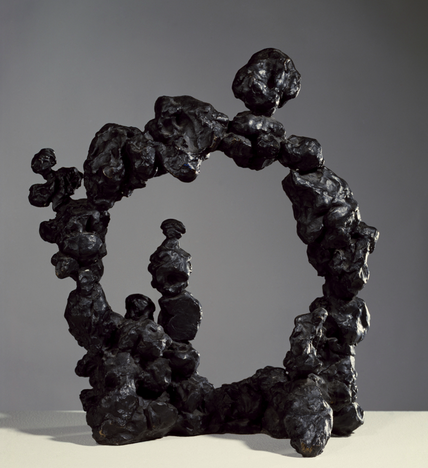 Concetto spaziale (Concept spatial), 1961, Collection particulière, courtesy Sperone Gallery, New York. 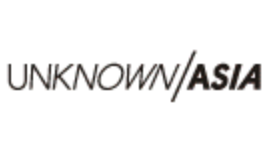 © Fondazione Lucio Fontana, Milano / by SIAE / Adagp, Paris 2014. 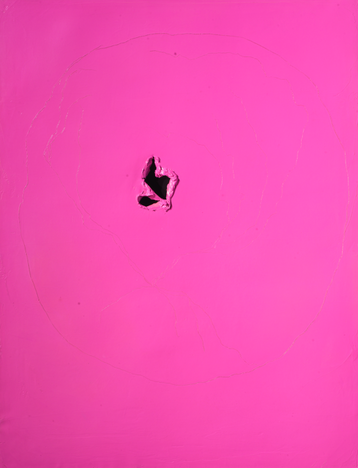 Concetto spaziale (Concept spatial), 1962, Courtesy Tornabuoni Art, Paris © Fondazione Lucio Fontana, Milano / by SIAE / Adagp, Paris 2014. The real success of the retrospective is nevertheless its capacity of offering a new overall vision of Fontana’s researches, of reassessing his talent, not only as a two dimensional artist but also as a sculptor and ceramic artist, with many pieces shown for the first time in France and impressive installations. The ceramics occupy a large part of the first half of the exhibition. Concetto spaziale, La Fine di Dio, 1963 Collection Musée national d’art moderne, Centre Pompidou © Centre Pompidou, MNAM-CCI, Dist. RMNGrand Palais / Adam Rzepka © Fondazione Lucio Fontana, Milano / by SIAE / Adagp, Paris 2014. Ranging from small to bigger scales, these ceramics are colourful and baroque, and fully express the bubbling creativity of Fontana’s mind, his large knowledge of art history and techniques, the influence of Christianity and of funeral sculptural art (which he produced during a large part of his life). Amusing movies and photographs also recall the artist dead-pan sense of humor and the dandy-like style he created for himself. 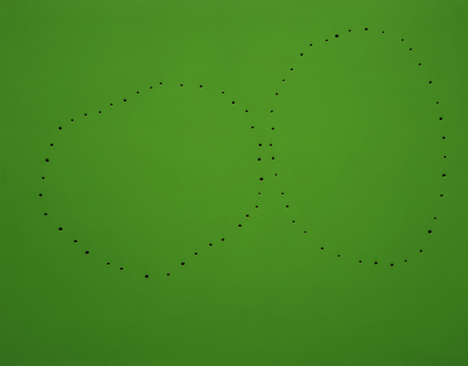 Concetto spaziale, Attese, (Concept spatial, Attentes), 1966 © Fondazione Lucio Fontana, Milano / by SIAE / Adagp, Paris 2014. Breaking the usual boundaries between abstraction and figuration, physical and metaphysical, Fontana navigated all along his career from utopia to reality, from science-fiction to Renaissance art, from kitsch to elegant and simple expression. He succeeded in harmoniously merging these very different concepts into a rich body of work that fully grasps the questionings of the twentieth century, and which remains as powerful now as it was then. 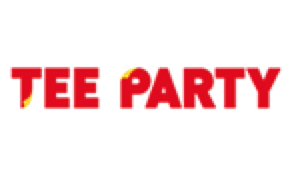 Address: 11 avenue du Président Wilson, 75116 Paris.